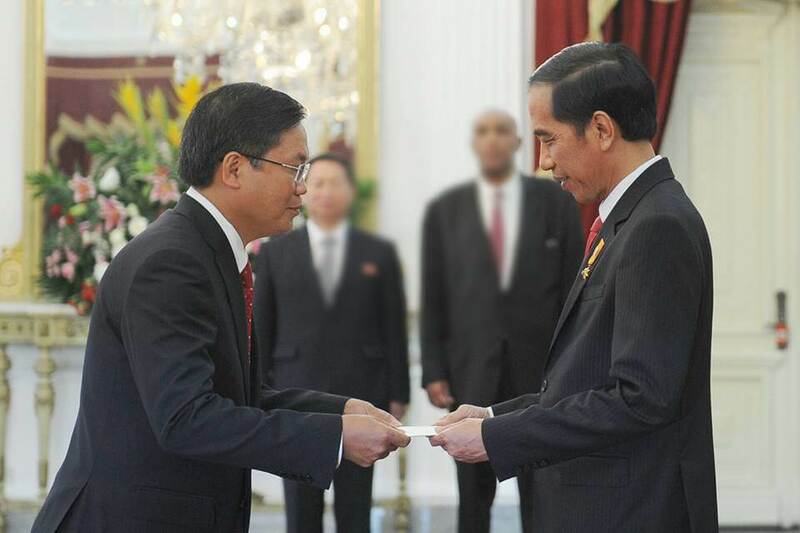 (News from the Indonesian Embassy VN) – November 13, 2015, Ambassador Extraordinary and Plenipotentiary of the Republic of Vietnam Socialist Republic of Indonesia at the Hoang Anh Tuan presentation of credentials to the President of the Republic of Indonesia, Joko Widodo. At the meeting, Ambassador Hoang Anh Tuan after presentation of credentials ceremony, the President of the Republic of Indonesia Joko “Jokowi” Widodo expressed his pleasure at the positive development of the relations of traditional friendship and good cooperation with Vietnam and praised Vietnam’s achievements in economic development, regional integration and international. Jokowi President expressed confidence the two countries would continue to strengthen cooperation in the fields of politics, economics, culture – society towards the common goal of preserving peace and stability in the region and make ASEAN community that is growing. Jokowi President congratulated Ambassador Hoang Anh Tuan and expressed the hope that the position of the Ambassador Extraordinary and Plenipotentiary of Vietnam in the Republic of Indonesia, Ambassador will serve as a bridge, to contribute positively to the strengthening and development further the friendly relations between the Government and the people of the two countries Indonesia and Vietnam. Ambassador Hoang Anh Tuan moved greetings and best wishes of President Truong Tan Sang, Prime Minister Nguyen Tan Dung to President Jokowi and his wife, the Government and people of Indonesia. Ambassador expressed his honor to receive the task in Indonesia at the time of the friendly relations and strategic partnership between Vietnam and Indonesia grow in breadth and depth, especially in the context of ASEAN is completing the last step together to form an ASEAN Community by the end of 2015. Ambassador Hoang Anh Tuan pledged to do his best to further promote the friendly relations and cooperation between the Government and the people of the two countries Vietnam – Indonesia. Ambassador promised to promote the Programme of Action to implement the strategic partnership between the two countries the period 2014 – 2018, boosting economic cooperation, trade and investment, as well as to strengthen cooperation in education, training and culture between the two countries.